Flying down a mountain trail over fine crushed gravel, whizzing past wildflowers and trout streams, and rumbling over old railroad trestles on a bike can be the highlight of any visitor’s trip in southwestern Virginia. 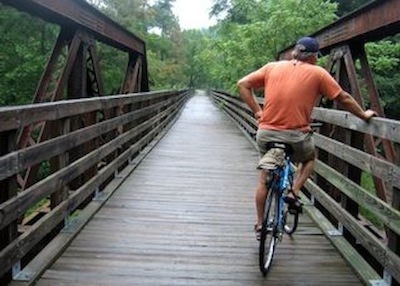 The Virginia Creeper Trail, built over the bed of the former Virginia-Carolina Railroad, travels through picturesque National Recreation and public lands. The 34-mile trek begins on Whitetop Mountain and delivers you, initially, to the town of Damascus. With a three to five percent grade, most of the first 17 miles is spent braking instead of peddling. From Damascus, ambitious bikers can continue another 17 miles over flat and rolling terrain to Abingdon, VA.
Biking down the mountain can also be a leisurely affair. Picnicking under trees, stopping to look out from the railroad bridges and relaxing next to a stream are wonderful ways to maximize your enjoyment of your surroundings. Most ages and skill levels can appreciate the trail. Families can rent a tag-along bike for young children or a pull-behind buggy for children too young to peddle or sit on a bike. Tag-alongs attach to an adult’s bike, tandem style, and the child can peddle or not. When you have worked up an appetite, Creeper Trail Café, 11 miles down from Whitetop, has burger and pork barbeque-type fare. In Damascus, you can take a break at In The Country Bakery and Eatery. Offering grilled chicken wraps, specialty burgers and ice cream, they are located next to the trail as you enter town. The smell of freshly baked waffle cones will lead you to their door. In Abingdon, Trail Café (right next to the path) offers a more upscale menu in a casual setting. Their California club with bacon, turkey, lettuce, tomato and avocado, whiskey chicken crepes, and decadent daily dessert specials provide ample reasons for traveling the additional miles. Seven shuttle and bike rental businesses in Damascus and Abingdon rent bikes and deliver bikers to the top of the trail. If you opt for the more challenging route of going up the elevation gain of 1,646 feet, the transport services can take you back to Damascus. Whitetop Station to Damascus is completed in an average of two and a half to three hours. The full trail takes around five and a half hours. Transport services and rentals run from $13 to around $35 depending on services provided. Reservations are recommended, especially during the popular fall leaf-changing season in October. 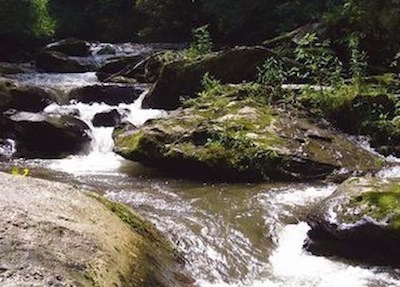 Virginia Backcountry in Damascus offers wilderness lodges, which include a private bath with hot water for $75 to $105. In Abingdon, they offer a fully furnished two-bedroom cabin for $135 to $155. 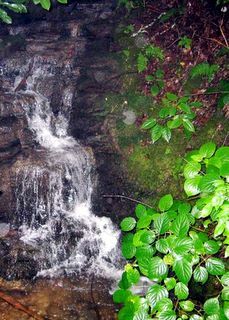 Phone (276) 356-9782, website:http://virginiabackcountry.com/, address: 19000 Wild Plum Dr., Glade Spring, VA. The Martha Washington Inn was built in 1832 and is furnished throughout with antiques. Rates run from $225 for a standard room to $695 for the premier suite. Phone (888) 999-8078, website: http://marthawashingtoninn.com/, address: 150 W. Main St., Abingdon, VA.